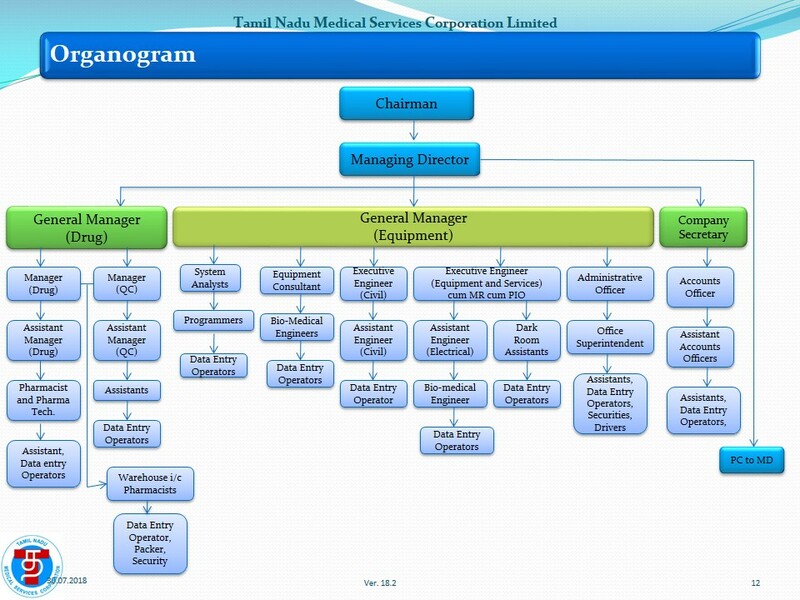 Tamil Nadu Medical Services Corporation Ltd., (TNMSC) was set up with the primary objective of ensuring ready availability of all essential drugs and medicines in the Govt Medical Institutions throughout the State by adopting a streamlined procedure for their procurement, storage and distribution . It was incorporated under the Companies Act, 1956 on 1/7/1994 and has commenced its functions of purchase, storage and distribution of drugs and medicines from January 1995. TNMSC aim is to make the drugs and materials available to the poorest of the poor and " Service to the Public ". The Board of Directors of the TNMSC consists of the following Directors. Procurement, testing, storage and supply of drugs and medicines, suture items and surgical items to the various Government Hospitals, Primary Health Centres and through them to the Health Subcentres throughout Tamilnadu. Procurement, storage and distribution of veterinary drugs to the various veterinary dispensaries under the control of the Directorate of Animal Husbandry.